Works best for steady traffic. 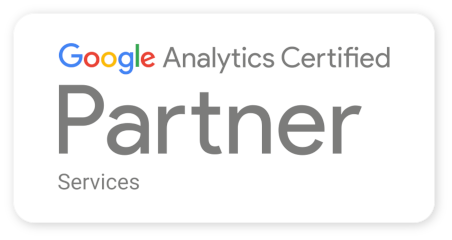 Setup Google Analytics alert by choosing metrics to track and we'll do the rest. 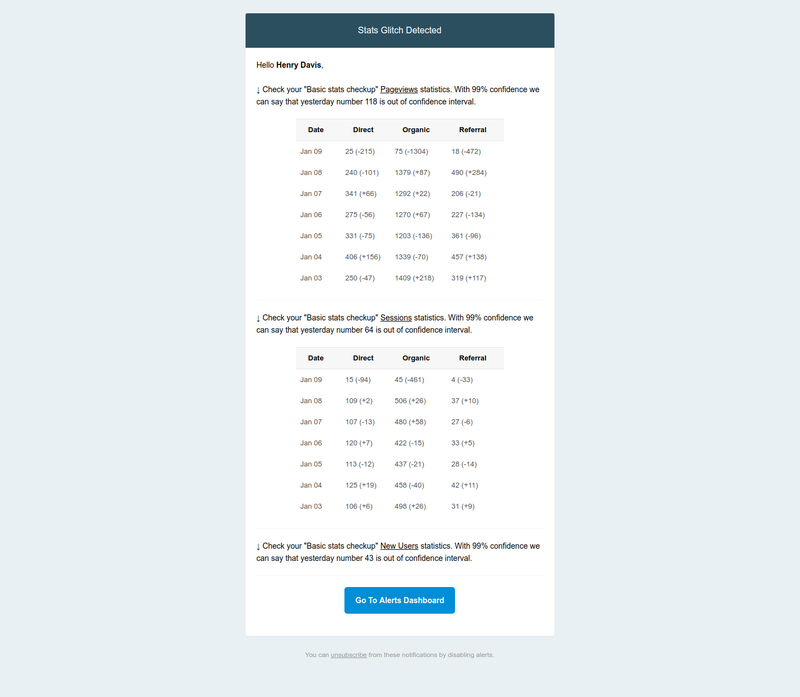 Statistically Significant Alerts. What if you already know your traffic and conversions patterns? Choose precisely under what conditions you'll want to get notifications. 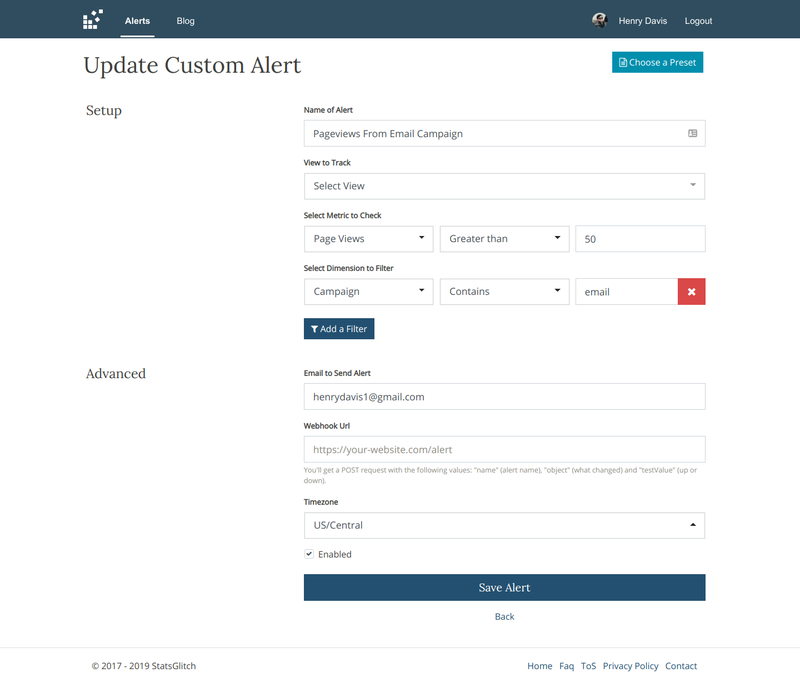 More about Custom Alerts. Need to make a fast decision? 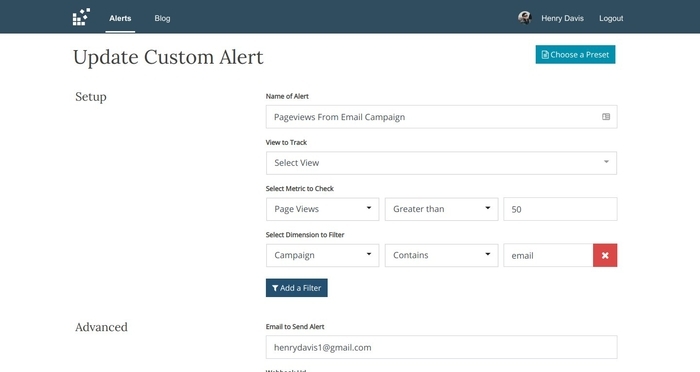 Get traffic change notifications in less than 5 minutes and be the ninja of your project. Real-time Alerts benefits. Webhooks support with other advanced options. 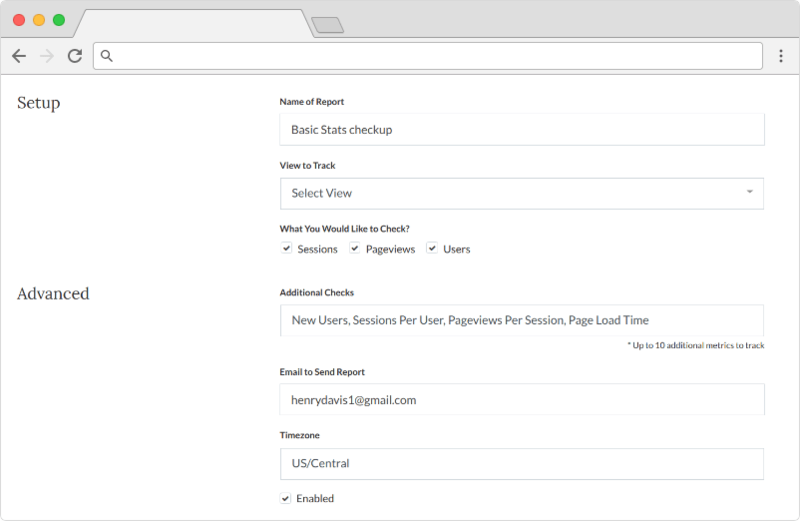 Weekly Overview Report will help you to monitor your most important metrics in a non-intrusive way. Get a summary of your traffic every Monday. Customize and choose the metrics you want to see. 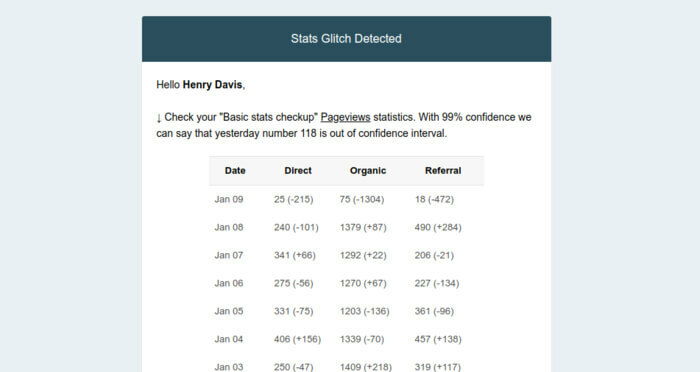 Send report directly to your client. Custom email / timezone for your personal report. We'll never share your email with anyone — We appreciate every user, we can't risk upon losing you. How It's Different From Google Analytics™ Alerts? A standard alert will check your chosen metrics and will notify you if they change in a statistically significant way. Real-time alerts allow you to take action right now if you find that something unusual is happening. 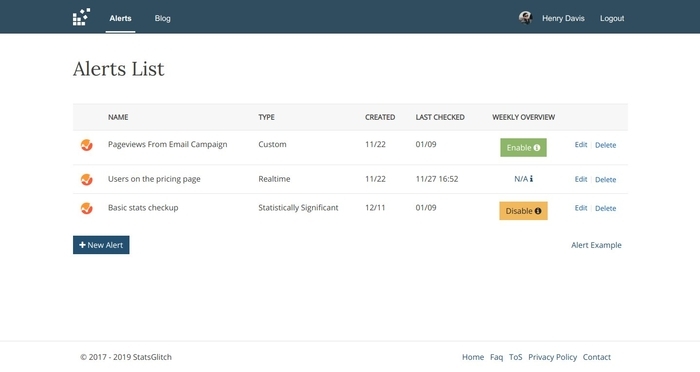 Setup custom alert to check how much traffic your link sharing partner is sending to you. If your e-shop tracks purchases as Google Analytics Goals, setup an alert and stay informed (via email or webhook) if last day purchases were lower than usual. After making a link partnership with other business, you can check how much traffic they're sending back to you and setup an alert if it's far below your expectations. 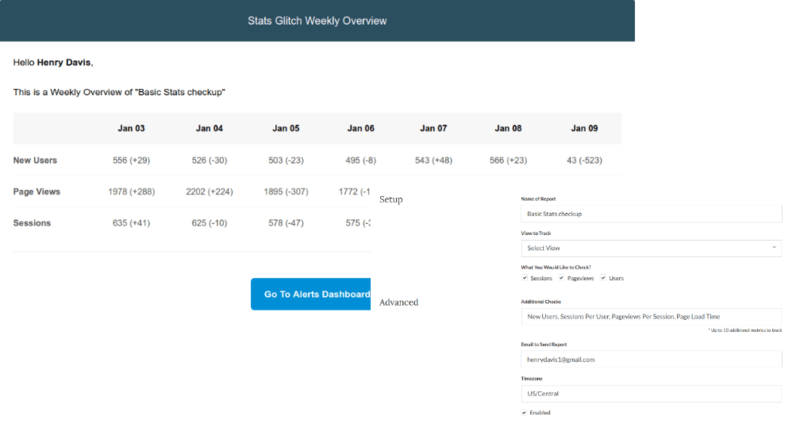 With a weekly overview, you can quickly check whenever your KPIs are in good shape. Just having Google Analytics is not enough?